So, do y’all know how it feels when you finally get a book that you’ve been waiting for but you’re scared to open it? The very idea gets your heart to racing and your palms get all sweaty and you keep reading the back cover trying to psych yourself out, ’cause you know that this book is everything you’ve been waiting for and more. And once you start reading it you know that nothing else in your life is going to matter, that you will NOT be bothered until you finish it? Y’all know what I’m talmbout. The way we feel when we know that Toni Morrison has a new book coming out. Well, that’s how I’m feeling right now, and although I know Mama Morrison has a new one coming out in April, that’s not the book that’s giving me the bubble guts right now. 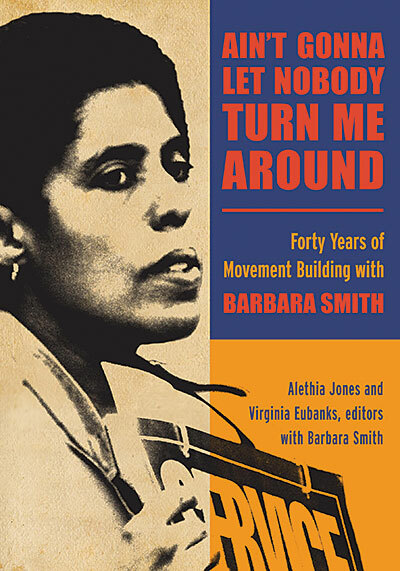 That book would be Ain’t Gonna Let Nobody Turn Me Around: Forty Years of Movement Building with Barbara Smith. I’ve just purchased my copy and I’m so anxious that I decided to write this blog instead of just reading it. Lest I sound like a crackpot, let me explain. Barbara Smith is a Black lesbian feminist icon. Her essay “Toward a Black Feminist Criticism,” written in 1977 formed the foundation of my own theory for writing about Black lesbian literature, and I am currently using it as the theoretical underpinning for my dissertation. Her work with the Combahee River Collective, in particular their bold statement of interlocking oppressions and feminist organizing would help to shape my own thinking on race, class, gender, and sexual orientation, and lead me to “coming out” as a Black lesbian feminist in grad school. Her work as a publisher, specifically the creation of Kitchen Table Women of Color Press with her sister Beverly, inspired me to start my own small press. I believe as Mama Morrison does, that if there is a book that hasn’t been written that you want to read, write it yourself. It follows then that if you want to see something in print that has yet to be published, do it yourself. That’s what Barbara Smith did, and I believe with all my heart that I can do it too. Before writing this post I spent 20 minutes trying to decide whether to by this new book about Smith’s life and work in print or download to my iPad. I finally decided to do both: I downloaded it because I could not bear to wait the two days it would take to get to my house. But I still need the print copy; I have to feel this book in my hands. Call me crazy, but the print book somehow seems more real, a physical representation of archive of this great woman’s work. At some point tomorrow I’ll start to read it. I can’t tonight; if I start it I’ll stay up all night reading, and I have to get up early to go to work. The struggle is real, y’all. So no, this is not a review of Ain’t Gonna Let Nobody Turn Me Around, but rather a love letter (albeit a strange one) to one of my heroes, a woman I’ve never met but whose work has had a huge impact on my life and work. I owe a huge debt to Smith and her generation of activists and writers, and I doubt many of the LGBT or queer scholars working today would be able to do the work that we are doing without Smith’s tireless efforts and advocacy on behalf of Black women, lesbians, and other oppressed peoples. I’m grateful to the editors, Alethia Jones and Virginia Eubanks as well, because I know this book must have been a labor of love.